Update (3-10-15): The Side by Side comparison tool has been updated for PDF Studio 10. Make sure to follow the appropriate instructions according to your version of PDF Studio. Go to View -> Compare Side by Side… in the menu bar. 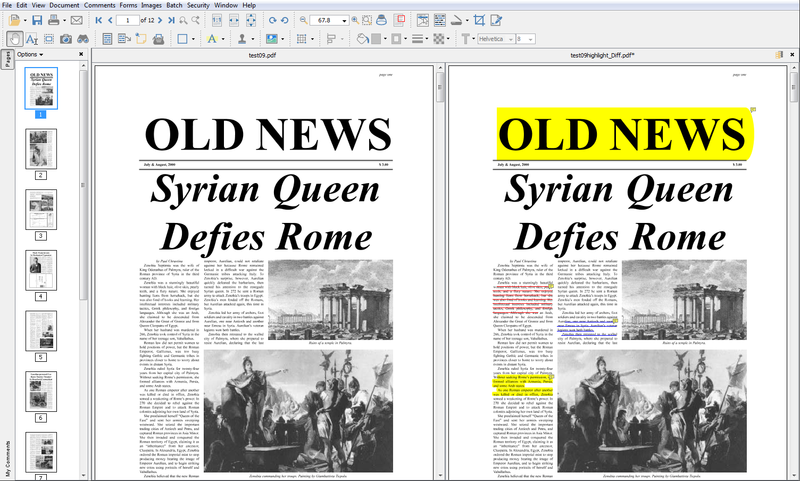 At any time during the comparison, using the toolbar, you can annotate or markup onto Document A. Select Text – Once the text is selected you can right click on the highlighted and choose a text markup action. It is possible to switch over to our Overlay Comparison mode by clicking on the Overlay button in the top right corner of the above Document B. Note: When switching over to Overlay Comparison View, if any changes have been made to Document B, PDF Studio will prompt you to save them. Select File > Compare Side by Side from the menu. A large window will open with two full sets of toolbars inside. Click on the Open button in each pane to open the versions of the file you want to compare. The documents are locked together with synchronized scrolling, making it easy to identify differences between the two versions. While in Compare Side by Side mode, each copy is still completely editable so you can copy changes from one version into another, add new content, or use any of the tools available on the toolbar above the documents.